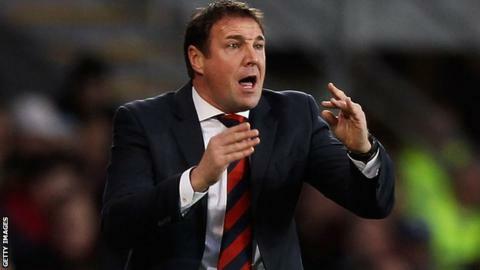 Cardiff City owner Vincent Tan is "extremely upset" after manager Malky Mackay said he was hoping to recruit three new players in the January transfer window. Chief executive Simon Lim says Tan feels Mackay has had sufficient funds to keep the club in the Premier League. He added ex-recruitment boss Iain Moody had been removed amid a £15m overspend. "As such, he [Tan] has stated that not a single penny will be made available in January," said Lim. In a statement issued by the club, Lim said: "Tan Sri Vincent Tan was extremely upset to read quotes from the manager concerning the possibility of new recruits, before he had been informed whether funds would be made available. "His view is that due to the funds already committed, including the originally-authorised summer transfer budget of £35m that rose to £50m in total, including add-ons, the manager has been fully supported. "I'm flabbergasted. Just when you think it's all going quiet at Cardiff City, this comes out. "What's he [Vincent Tan] extremely upset about? "I really don't understand it. Cardiff had to spend a lot of money just to be competitive in this division." "The overspending of £15m has upset Tan Sri greatly, resulting in the removal of Iain Moody as head of recruitment. As such, he has stated that not a single penny will be made available in January. Iain Moody was replaced as head of recruitment in October by Kazakh Alisher Apsalyamov, who was at Cardiff on work experience before his appointment and has since been temporarily suspended in a query over his visa. Moody has since taken up a role at Crystal Palace. Mackay's comments came after Saturday's 1-0 win over West Brom, with the Scotsman suggesting he would like to strengthen his squad. "It would be great if we can bring in three quality additions to the squad," said Mackay. "I would look to strengthen all three departments in terms of a defender, a midfielder and an attacking player." Mackay, however, praised the club's board for the backing they gave him during the summer, and that he was awaiting guidance from them as to how much he will have to spend next month. "I will talk to my chairman [about January] who will then discuss it with the board of directors and our owner and I will take my lead from them," he said. "It's up to them what they want to spend in January. "I've got my lists of players, whether they be permanent targets or loans for various positions. We've got to try to strengthen again." Cardiff are in 15th place in the Premier League table, four points above the relegation zone, after gaining promotion from the Championship last season.